We have a plan! Well the drs have a plan and we think its a good one. Tuesday is going to start chemo/radiation to shrink the tumor. It will be outpatient so that means she will be in the hospital for half the day and then home where she belongs. The radiologist is pretty confident he can shrink that tumor down to a small enough size for surgery or even shrink it completely. Then they are going to NYC. They have the top neuroblastoma hospital in the country there and they are anxiously waiting Tuesday's arrival. If she needs surgery, the top surgeon in the country will be there to perform it. And then she will start antibody therapy. They do this instead of the stem cell transplant and it seems like a better course of action in Tuesday's case. The good news is that they have had success in cases just like Tuesdays. There is real hope now. The family is in much better spirits with a plan in place and we all feel confident that Tuesday will fight and win. I asked JK if there was anything else besides praying that we could all do. She said "send the hands." She really wants to have that whole room covered in everyone's hands traced with messages for Tuesday. So please send me your hands. Or email me and if I know you personally I will give you their address to send them directly. Lets cover every square inch of that hospital room with our hands. All it takes is a little time and it would mean the world to her family. Trace the hands of everyone in your family. 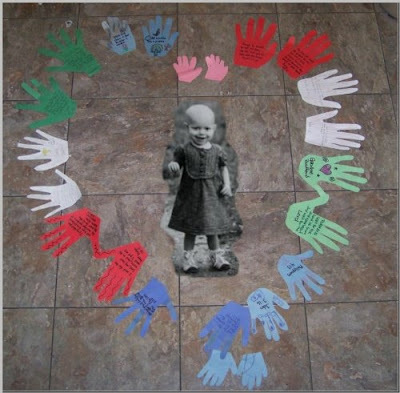 Have your children get the hands traced of all the kids in their classrooms. Lets bombard them with hands! Just think of how beautiful it will be and how much faith and strength it will give them! Now there is the issue of the cost of going to NYC. We all know its incredibly expensive. Luckily a dear friend of ours has offered up her home and she only lives 20 minutes from NYC by train. So that is amazingly generous and an incredible gift. But they are still going to have to pay to park, ride the train, eat, etc. And it adds up quick. So I need your help. I am not asking for money (though if you have any to spare it would be wonderful). I am asking for ideas. I need ideas of ways to raise money. Ideas that will work. My brain is pretty much fried so I need some help coming up with great ideas. Tuesday's family has so much to worry about, I want to be able to take away one of the stresses. Please put on your thinking caps and help me figure out a way to help this family! Yesterday I received a phone call that absolutely terrified me. It was my dear friend JK, crying. Of course the worst went through my mind and then I was told words that left me in shock. Tuesday has another tumor. A little over a week ago we were all celebrating Tuesday's no evidence of disease clearance. And now, as quick as lightening, she has another tumor. She had a 2cm by 2 cm calcified spot in her abdomen after all chemo and the scans. Everything came back clear. But then something wasn't right. Tuesday started having horrible pain in her abdomen. On Christmas Eve they took her to the ER and they thought maybe she had a bowel obstruction. They did xrays and nothing was there. Then they decided it was her bowels telescoping which is common after major abdominal surgery in little ones. But JK knew it was something else. Yesterday they did a CT Scan. the 2x2 "calicified" spot was now a 9x7 mass. It is growing rapidly. It is cancer. The drs are all stunned. How could this happen? For a cancer to grow so quickly after 5 rounds of chemo is unheard of. They currently have no clear treament plan. They sent her home yesterday with a bunch of pain meds and are taking the weekend to confer with drs around the country on the matter and create a game plan. Monday she will have a PET Scan and a consult and hopefully they will come up with a plan on how to beat this. There will be no stem cell transplant at this time. We were all gearing up for that endeavor but I guess God has another battle in mind first. I am not going to lie, the odds are highly stacked against her. This is why it is so important that you pray. Let God be flooded with all of our voices asking for him to help Tuesday. Tuesday has been such an inspiration for so many. She has brought God back into many lives who had pushed him away. Her family needs strength and she needs to beat this. For all of us. Please pray for Tuesday. Last Friday we met up with our friends Tonya, Jayden, Marisol and Flynn for the Festival of Lights at the San Diego Wild Animal Park. This year marks the 20th and final year of the festival. Next year it will be moved to the San Diego Zoo under the name Jungle Bells. The festival runs until January 3rd so if you are in the area, check it out and be a part of the final festival. Once night falls the park is transformed with holiday lights, craft activities for the kids, a holiday light show, black light puppet theater, a snow hill, and animal presentations. Oh and of course, lets not forget Santa! I managed to get my kids to pose with Santa by having them sit on my lap and then the ever so clever Santa snuck in behind me and smiled. Hey- you take what you can get with two year olds. A note of warning- after the lights go down, most of the animals go to sleep so if you want to get your fill of animal fun, come before the sun sets and then plan on staying late for the lights. We have a season pass ( a dream of mine since I was a child) so we just came for the lights and all we ended up seeing was an opossum. Not that the kids seemed to mind. They were happy to be running about with their friends, taking in all the beautiful scenery. Oh and if all of this wasn't enough to make you want to come out and enjoy the park, here is my final selling point: they have hot chocolate with Bailey's. Yummy! Check out Candid Carrie for more great Friday pictures. Last week it was 75 degrees outside. In December! As a recent Northern California transplant I found this to be amazing. I grew up in Southern California but it has been so long since I lived down here that I forgot just how warm the weather can be any time of the year. I decided since it was 75 degrees outside in December we needed to get our butts to the beach. Maybe after a while the novelty of the winter warm spell will wear off but for now I am absolutely tickled pink about a winter day at the beach that doesn't involve a parka. I decided to go to Crystal Cove State Park because I knew there would be a parking lot that didn't require me to attempt to cross Pacific Coast Highway with my toddlers like that old Atari game, Frogger, while hoping nobody got killed in the process. We pulled into the almost empty parking lot and followed the trail down the bluff to a beach that was almost completely empty. I couldn't believe it. We live in a population center of millions and hardly a soul was at the beach! Were they insane? I think so. It was 75 with just a slight ocean breeze. You couldn't ask for a better day to be at the beach. And what a gorgeous beach! Since it is a state park it looks exactly as it did 100 years ago and it will continue to look the same way for years to come. There are pristine beaches, steep bluffs covered in native plant life (instead of the ever present multi million dollar mansions), and large expanses of tide pools surrounded by rock. Paradise. Truly. The twins had an absolute blast running around in the sand, exploring tide pools, and just being kids. I just kept having to pinch myself. I felt like I was on vacation. It was wonderful. We were lucky and stumbled upon the peak of low tide. The kids loved exploring the pockets of water which were filled tiny sea life. Pelicans and sea gulls flew overhead (I am not a big sea gull fan. I like to refer to them as flying rats) and huge rocks were covered with the biggest mussels I have ever seen. The kids just couldn't get enough of the tide pools that we spent nearly three hours exploring. There are two main sections of beach at Crystal Cove. There is El Moro Cove (this is where we were) which is basically a large expanse of beach front with tide pools, bluffs, rocks, and sea life. The other section of beach, The Historic District, has cottages for rent (at an affordable rate I might add. Truly a wonderful way to have a beach vacation), a boardwalk, a shake shack, The Beachcomber Cafe, and more sand and sea. Then there is the back country area which has plenty of hiking trails and some primitive hike in campsites. They are also in the process of building a large drive in camping area which will be across the street from the beach. Finally, there is the underwater park which allows people to dive or kayak in an 1140 acre protected are of ocean. Not bad, eh? Come June and July, Crystal Cove will be packed full of surfers, swimmers, and beach combers so why not take that next warm sunny day and head out to Crystal Cove State Park so you can have it all to yourself (well you may have to share it with me and the kids but I promise to share)? All scans have come back with NO EVIDENCE OF DISEASE!!!!! Its truly a miracle and blessing. This means her bone marrow will be clean for the stem cell transplant and little Tuesday finally has the cancer out of her body! A rough, rough road is ahead of her come December 29th when stem cell transplant occurs but just as she pulled through life support and tumors filling her body, she will pull through this. She will be one of the positive statistics. God is watching over her and prayers are being answered. If you have never believed in miracles before, now is the time to start believing. All I want for Christmas is a cancer free Tuesday. Her family has been through so much and she is truly an angel on earth. Please keep that horrible disease away from her body. And maybe throw in a pair of the sweater boots I have been eyeing. You know, the brown ones. Thanks! On the 29th of this month Tuesday will begin her stem cell transplant. In the next 2 weeks, she will undergo 22 scans and procedures! TWENTY-TWO! This week, she is having scans to make sure her last round of Chemo wiped out the cancer still remaining after her surgery. We all need to pray that her scans come back clean. And don't forget to go to her blog and let them know you are praying. With the new year fast approaching, it's time to start shopping for calendars. Everywhere you go, there are displays of lots of different types of calendars for many different prices, right? Well, a friend of mine has put together a calendar that will not only help you keep track of the days in the coming year, but will allow you to give back too. The name of the calendar? For the Love of Tuesday. This calendar features beautiful pictures of some of my favorite twin sets from our multiple group and all proceeds go to help in Tuesday's battle against Neuroblastoma. Ben and Mari are featured in the calendar so check it out! Even if you have a calendar already, this would be a wonderful way to show your support to a family who really needs it this holiday season. Click on this link to check it out! At the end of the month, little Tuesday will be in the hospital receiving her stem cell transplant, which will render her very weak and susceptible to infection. 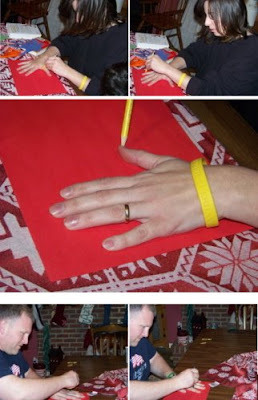 Jess is asking that everyone trace their hands, write inspirational messages on them, cut them out and send them to her home. While Tuesday is recovering in the hospital, her big brothers will get to lay our healing hands on their little sister's body. It is Jess' dream that not only will Tuesday's entire body be covered with the healing love and prayers, but that their whole wall will be. Showing off their work and FYI, they each found their own bible verses to write on their hands and I must admit, I was very impressed with the words they chose. If any of you would like to participate please trace your hands and send me a message and I will give the address of where to send them. I hope we can overwhelm Tuesday's family with our support. I hope you all keep this family in your prayers through the holidays. I have never met a more worthy group. This year we have a Noble Fir. Its a big step up in our house from the lowly Douglas Firs of year's past. I have always wanted a Noble Fir but they have always been out of our price range. I guess one good thing about a crappy economy is that the Noble's were deeply discounted at Home Depot. We were tipped off by my brother about the bargain so off we hurried to Home Depot to pick up one of our very own. This was the kids' first experience in picking out a tree. The first year, they were only three months old and I went from store to store a week before Christmas searching desperately for a tree. There wasn't a tree to be found anywhere. As I headed home with tears in my sleep deprived eyes, I remembered there was a tree farm out in the country not far from our house. Lucky for me they had a few trees left! Unlucky for me, I only had about $20 in my pocket to spend on a tree and everything left was way out of my price range. After seeing me completely deflate, the man took pity on me (or wanted to get rid of the last of his trees) and gave me a tree for $20. We put it up and celebrated our first Christmas as a family. The next year was just sad. We were in the middle of waiting to hear when we would have to move so we just had to sit, wait, and be ready to go at any time. We didn't bother unpacking the Christmas decorations because that would be one more thing to scramble to put in a box once we got notice. I ended up buying a Charlie Brown Christmas Tree (They sold them at Urban Outfitters and I felt it was truly appropriate given our situation) and put it on our kitchen table for us to all gather around and feel pathetic. This year things were going to be different. We may not have much in our bank accounts but we were going to have a nice Christmas tree! The decorations were up inside the house and the perfect spot for the tree was waiting in the kids play area. We drove up the road to that mega home improvement store we all know so well. Immediately the kids were taken by the spectacle of it all (honestly they were mostly excited about the left over Christmas tree string that was on the floor but they were excited nonetheless). Poor Paul unwrapped 8 trees and I nixed them all. They just weren't the right tree. Finally my exacerbated husband told me he would watch the kids and I could find the tree. I perused the stack of trees, found one for Mr. Home Depot to open, and guess what? That's right baby. The perfect tree on my first try. While Mr. Home Depot prepared the tree for its new home, Mari checked out all the tree department had to offer (Ben was still fascinated with the string). Soon the tree was on our roof and on its way to its new home. Its a beautiful tree if I do say so myself. I don't miss Sacramento. Sorry all you Sacramento fans out there but it wasn't for me. There are a few things in Sacramento that I do miss. Dos Coyotes Border Cafe. That restaurant holds a very special place in my stomach. Whenever I come back up for a visit you better believe I will be waiting in line for my Ranchero Burrito. Chico's tacos. Still the best shredded beef tacos I have ever had. Driving over the river in fall. It really is so pretty see tree tops of all different colors edging the river below. And Fairytale Town. A Sacramento institution that is truly the perfect place to take a toddler. We went to Fairytale Town with Auntie Chrissy one last time before the big move. The kids hadn't been in a year and I wanted to take them back since they are big two year olds now. Fairytale Town brings nursery rhymes and fairy tales to life with farm animals, play structures, and plenty of whimsical scenery. Everything is detailed to delight the toddler eye, right down to the hippo drinking fountain. You want Three Little Pigs? They actually have three little pigs. You want Mary's Little Lamb? Well I do believe we spotted her (though I don't think she is quite so little anymore). If you want to run under the Little Old Lady's Shoe, sail in Captain Hook's Pirate Ship, ride in Cinderella's Pumpkin Coach, climb through the Giant's foot on your way to slide down the Beanstalk, or help Jack and Jill fetch a pail of water, you can do it at Fairytale Town. I guarantee a wonderful day will be had by all those young at heart.